When I first heard about No Man's Sky I didn't know what all the fuss was about. 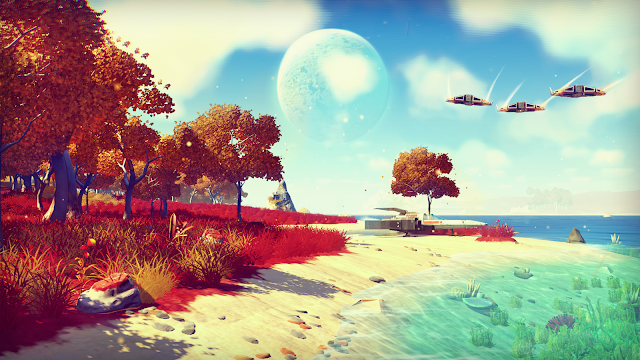 It won awards for "Best Original Game", "Best Independent Game" and "Special Commendation for Innovation" at E3 2014 which is pretty impressive but I guess it's the fact that the game is being developed by a relatively unknown British studio called Hello Games that piqued my interest. Not only that, but the studio has only 10 employees and when you check out what the game is about, it's a pretty ambitious project. Basically, No Man's Sky is about exploring a procedurally generated universe, so it sounds a bit like Frontier: Elite II or the more recent Elite: Dangerous in that regard. What makes it quite a bit different though is that many of these worlds will be teeming with life and once you've discovered these new worlds you'll be able to share them with other players - which sounds a little bit like the Space Age in Spore. These concepts on their own are nothing truly innovative but I guess combining them together is why everyone seems to be so excited and it definitely is a promising concept. For those not satisfied with just exploring the universe though, the game is also set to feature space and first person combat, and there'll be a purpose to finding new worlds as you'll need to collect resources in order to trade them for new ships, suits and equipment. This all sounds great and I really dig the art style and music for the game, but can Hello Games pull it off? I mean it's only a 10 person development studio and their previous games were targeted for the mobile market. Fingers crossed they do although it might be awhile before PC players actually get their hands on it since it's sadly a PS4 timed exclusive.